Frame is painted FDA white with a two part industrial grade, epoxy finishing system. Frame is a stationary, bolt down design. 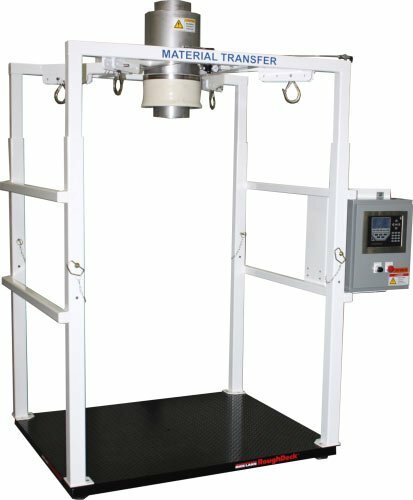 Gain-in-weight carbon steel platform scale system (5,000 lb. capacity) with alloy load cells and NEMA 4 summing box. The 8” diameter inlet tube and product contact surfaces are 304 stainless steel. Stainless steel fill head includes outer dust control sleeve with 4” dust take off stub. Food grade inflatable spout seal assures a dust tight seal to bag inlet. The manual inflation control is mounted to the frame. NEMA 4 control box includes a digital weight indicator to actuate the diverter valve for the discharge of product to the other filler unit.